Friday, May 12, 2017 6:30 PM Clarkston High School AWAY 4 Howell High School HOME 5 Game Recap Clarkston fought for the win, but lost in the bottom of the 5th. Season record is 12-4. Next game is Tuesday, at Athens. Friday, May 12, 2017 4:30 PM Clarkston High School AWAY 5 Howell High School HOME 13 Game Recap Errors and weak hitting doomed the Wolves in the first game. Wednesday, March 1, 2017 7:00 PM Clarkston High School AWAY 36 Oxford High School HOME 30 Game Recap Wolves win 36-30 over Oxford. Beck with 14pts. Heaton with 10. Monday, February 27, 2017 7:00 PM Pontiac High School AWAY 27 Clarkston High School HOME 54 Game Recap Wolves win their first district game, beating Pontiac 54-27. Luchenbach with 18pts 16 rebs. Nicholson with 14pts. Next game is 5:30 Wednesday against Oxford. Thursday, February 23, 2017 5:30 PM Clarkston High School AWAY 40 OPEN DATE HOME 34 Game Recap Great road win for the Wolves. Great way to wrap up their JV basketball season. Lauren Cody scored 15 points going 7 for 7 from the free throw line. Sloan Curtis added 13 points and 15 rebounds. 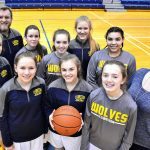 Wednesday, February 22, 2017 7:00 PM Clarkston High School AWAY 46 Oxford HOME 36 Game Recap Wolves beat Oxford 46-36 to move to 15-5 on a modified senior night. Seniors McKillop (8), Storey (6) & Page (4) . Luchenbach (12) and Beck (10) also scored for Clarkston.